I listened to this audiobook over the course of a weekend. It is a very compelling listen and is a read-a-like for anyone who likes the Freakonomics series and Malcolm Gladwell books. The best motiva tion is intrinsic and offering rewards can dampen the enjoyment and interest in an activity. School children who liked to draw were offered a reward. When the reward was removed the children dramatically curtailed their drawing to levels far below what they were doing prior to the experiment. The children who were offered no reward continued to draw for pleasure. Rewards do have their place. They are effective when the task is rote and tedious- such as stuffing envelopes. The extrinsic reward is effective because a person would probably not choose this activity as a hobby or for pleasure. The real motivators for people are a sense of autonomy, mastery, and purpose. In the case of stuffing envelopes, in the place of a reward, a supervisor could motive the employee to work faster by explaining the purpose of the mailing and allowing the employee the autonomy to determine how they would like to accomplish the task. 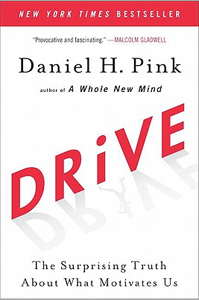 Another great book by Daniel Pink is To Sell is Human. It is also a good book to listen to. This entry was posted on April 24, 2015 at 12:35 pm and is filed under Adult Readers Advisory, Non-fiction. You can follow any responses to this entry through the RSS 2.0 feed. You can leave a response, or trackback from your own site.